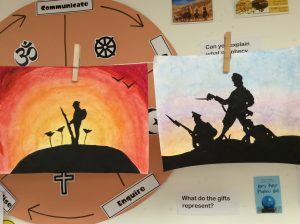 This week, Year 5 and 6 have been learning about the significance of Remembrance Day. We spoke about why it is important that those who fought in the World Wars are never forgotten, read examples of war poetry and wrote prayers to read out in church. In addition to this, we used pastels and black paper to create some beautiful silhouette artwork, which is now on display in our classroom. We think you’ll agree, from the examples in the photo, the effect is quite spectacular!